So much for the death of America's bull market. U.S. stocks zoomed to their first record high in more than a year on Monday. 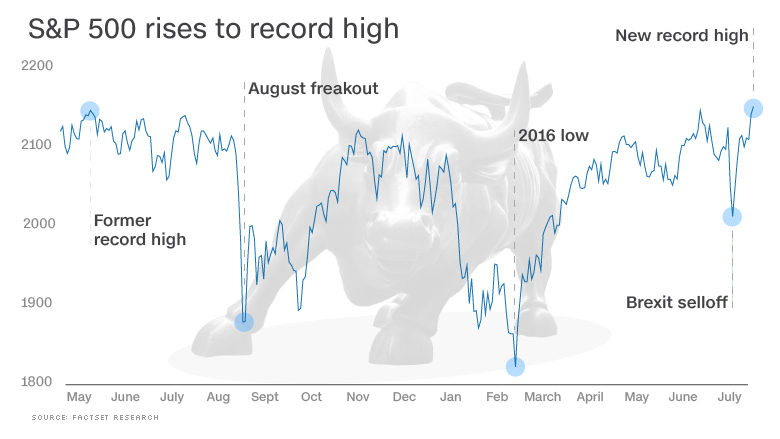 The S&P 500 closed above 2,137, surpassing the previous all-time record set back in May 2015. That ends a 14-month period where the markets appeared to hit a wall and even fell precipitously at one point and flirted with a new bear market. "This proves all the chatter about the demise of the bull market to be wrong," said Ed Yardeni, president of investment advisory Yardeni Research. 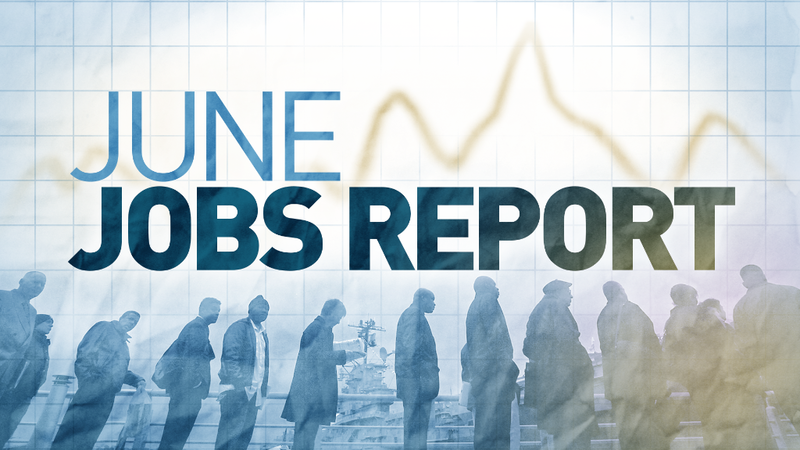 Markets are in a terrific mood after the blockbuster June jobs report that dramatically eased fears of a slowdown in the U.S. economy. The strong economic news sent the Dow soaring 251 points on Friday and left the S&P 500 just shy of a new closing high. Of course, this was hardly the only panic attack and subsequent recovery to rock the seven-year bull market in stocks. In the past year alone there have been three: the August 24, 2015 scare when the Dow briefly plummeted 1,000 points, the early 2016 plunge caused by fears about China's slowdown and cheap oil and the Brexit selloff. After each event, the market recovered. But this time, it's charting new highs. So, how much more room to stocks have to run? That depends on who you talk to, of course. Are stocks too expensive? The bears think trouble is brewing. They point to how expensive the stock market is, especially in this slow-growth environment. The S&P 500 is trading at 17.1 times forward earnings estimates -- near the loftiest levels of the past seven years, according to S&P Global Market Intelligence. Even Federal Reserve chief Janet Yellen recently warned about how pricey stocks are compared with recent history. Russell Investments is underweight U.S. stocks, warning they are "outright expensive" and the rich price tags skew the risks to the downside going forward. Market skeptics also point to the lingering earnings recession, which is coming into focus this week with Alcoa (AA) kicking off second-quarter earnings season. Corporate profits are expected to shrink for the fourth-consecutive quarter as the one-two punch of cheap oil and the strong U.S. dollar continue to dent bottom lines. "Earnings growth will be a prerequisite for this market to move higher," said David Joy, chief market strategist at Amerprise Financial. Stocks aren't as pricey as bonds: Despite those challenges, the bulls are betting on more record-shattering. The Dow is a little more than 100 points away from its all-time high of 18,351.36. The Nasdaq is a bit further away (around 5%) from its magic number of 5,231.94. Investors are rejoicing that the jobs report shows the U.S. economy continues to chug along in the face of trouble overseas, especially in Europe, Japan and elsewhere. It quiets recession fears and it could soon put a stop to the earnings recession. Low bond yields makes stocks look less expensive by comparison and encourage companies to borrow money to invest in the future, pay fat dividends and buy back stock. Yardeni, a bull since early 2009, is advising clients to "stay invested." Yet Yardeni admitted that valuations are in "nose-bleed territory," so he's not an enthusiastic buyer until earnings start growing again.